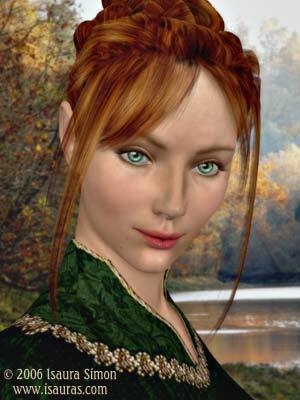 Amaltea has red hair and green eyes. She is 5'5" tall and very skilled with the sword. As heir to the throne of Barsi, she was trained by the best teachers in the kingdom. Barsi is a small continent similar to Earth's Great Britain, and the time period is similar to Earth's early Napoleonic. Magic is not common. It has largely been replaced by technology, just as gunpowder is supplanting swordplay. She married Xenograg kathu-Darelir, and they rule Barsi side by side. They have three children: Torin (heir to the throne), Amanda, and Urrograg.